Although U.S. Marines had broken the back of the Japanese on Guadalcanal in furious combat between August 1942 and February 1943, much hard fighting remained to be endured on jungle-choked islands to the north. Between late 1942 and the end of 1943, the Marines on the ground and in the air took part in a series of battles and campaigns in the central and northern Solomon Islands, all part of the effort to reach and neutralize the Japanese regional air, naval and supply base at Rabaul, at the northeastern tip of New Britain. Throughout these campaigns, first over and on New Georgia,and then over and on Bougainville, the Marines fought their way through some of the most difficult terrain and inhospitable weather encountered in World War II. As a result of the unbroken chain of land and air victories along the Solomons chain, the mighty Japanese fortress at Rabaul was brought within range of American and New Zealand air groups operating from Bougainville and other surrounding island air bases. The aggressive, unremitting offensive efforts supported by these bases secured the flank of the continuing American and Australiam campaign for eastern New Guinea. The high tide of Japanese conquest in the South and Southwest Pacific areas would recede, and the Marines would be free to undertake the long-planned island-hopping campaign in the Central Pacific and the Philippines, all the way to the Japanese home islands. Military historian Eric Hammel has scoured the archives for photos of Marines in Pacific War combat and has unearthed thousands of rare, many never-before-published images. 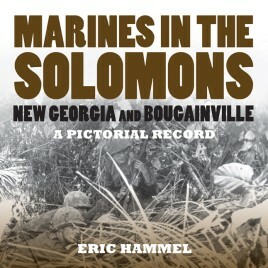 In this most-comprehensive photographic history of the Marine battles in the central and northern Solomons, Hammel adds to the depth of his previous World War II Marine Corps pictorial histories. Hundreds of photographs coupled with Hammel’s brief, insightful narrative provide a fitting tribute to the Marines who fought their way across the South Pacific.